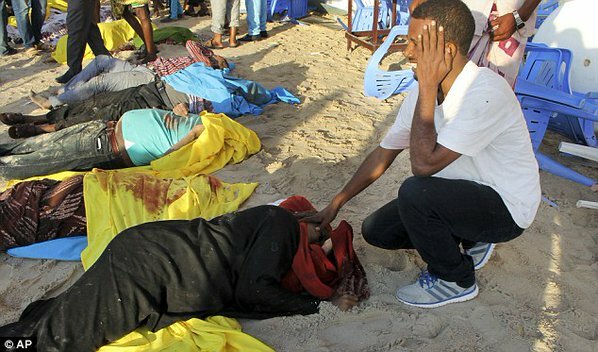 A man was overcome with emotion as he put his hand on his slain sister's corpse following a restaurant attack in Somalia. Twenty people were killed when a suicide car bomber rammed the gates of a seaside restaurant in Somalia's capital Mogadishu last night and Islamists fought their way inside firing at diners. Witnesses said the gunmen shouted 'Allahu akbar', Arabic for 'God is great', and fired indiscriminately at people sitting near the beach. 'They randomly fired at the people sitting near the beach before entering the restaurant,' said witness Ahmed Nur, who was strolling along on the shoreline when the attack happened. 'The place was packed when the [gunmen] came, so the number of casualties will probably rise,' Hussein said. 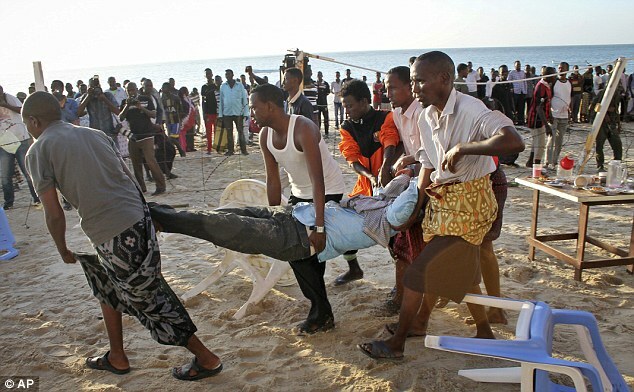 Al-Qaeda-linked Al-Shabaab claimed responsibility for the attack and the deadly siege inside the the Liido Seafood restaurant, which is popular with Mogadishu's elite and government officials, police official Capt. Mohamed Hussein said.